There’s a well known U.S. affordable housing crisis. Lawrence Yun at the National Association of Realtors said earlier this year that only builders getting really busy will close the gap, which he estimated at the time as 8.3 million housing units. A number of tech gurus have said that only factory-home building can close that housing construction needs gap. and others are among those in 2018 that have praised the quality, surprising safety, and value of today’s manufactured homes. Yet the manufactured housing industry struggles in its actual performance, in bottom-line new-home sales. Why? But let’s focus for the next few minutes on access to capital and financing. There are few in manufactured housing who can as credibly claim to understand the import and legal methods of raising capital as Equity LifeStyle Properties (ELS) Chairman Sam Zell. Zell has numerous other business interests. He is worth billions. He’s been quoted saying he is happy to be correct 60 or 70 percent of the time. Billionaire Warren Buffett has famously been critiqued – and admitted on occasion – to making mistakes or missing opportunities too. Not to worry, because the baseball slugger who consistently bats .350 or better is worth millions annually. Thankfully, no one has to bat a 1,000 to be successful. So perfection isn’t the standard in business or investing. Consistency, overall performance, quality, profitability, legality – and hopefully ethics are, or should be – the standards. Toyota recently recalled 192,000 Prius vehicles in the U.S. alone. Pay attention, because that won’t cause much of a hiccup for sales by Toyota. So why, by contrast, does bad news so routinely harm manufactured homes so much more? Furthermore, the manufactured home (MH) industry can be segmented into corporate giants, mid-level, smaller or even ‘mom and pop‘ sized enterprises. Zell’s and Buffett’s interests in the MH Industry have both been represented on the Manufactured Housing Institute (MHI) Executive Committee level for years. That’s where the power is at the MHI trade association. The two moguls each know how to attract media when they want it. But given all that, it should not be construed to mean that Buffett or Zell’s interests are always in synch. Nor are Buffett’s and Zell’s politics apparently in alignment. According to Open Secrets, which relies on public records, Sam Zell gave 100 percent to Republican candidates up to the 2018 reporting period reflected in the graphic, shown above. By contrast, Warren Buffett gave 100 percent of his campaign contributions to Democratic ones, as the image below demonstrates. Keep you friends close, and your enemies closer. With that backdrop, it is useful for manufactured home professionals to glance at the concept of interlocking directorates. which can then be wielded in a dynamically similar way as interlocking directorates operate. As a reminder, here are MHI’s antitrust guidelines, and note the highlighted portions. What perhaps too few in the trenches of manufactured housing grasp are how influence, information, and even power can be wielded by means of connections that are technically public, but if unreported or ignored, are effectively invisible. That isn’t a conspiracy, and it can be done in legal or illicit ways, as the prior definition, link to MHI’s antitrust guidelines, and graphics above itself suggests. Those like Zell grasp this reality well, per our industry sources. Bluntly rephrased, Buffett has funded through various channels radical and leftist organizations that have deliberately targeted Zell’s ELS brand. And if you are Sun Communities, UMH Properties, or any other sized manufactured home community or other MH operation, ponder this question. If Buffett’s money was used to target Zell, why wouldn’t they your or any other firm too? Warren Buffett has been funding leftist and Democratic causes and candidates for years. Among them are MHAction, which targeted via protest and mainstream media, ELS, among others in the industry. MHAction – which again benefited from cash that flowed from Buffett – also disrupted the address by HUD Secretary Ben Carson in Las Vegas last April. Furthermore, Buffett’s Berkshire brand Clayton – per sources – has purportedly paid one or more writers who have spotlighted speaker/authors like Esther Sullivan. Professor Sullivan presents a mishmash of pro- and anti-manufactured home positions, most notably negative with regard the owners of certain manufactured home communities. Blackstone – which entered manufactured home communities this year – and other community owners have been targeted by groups that were funded by sources that were given millions from Buffett’s coffers. It’s not speculation, because there’s a public record and a money trail. MHAction, MoveOn, The Indivisible Project, AntiFa are among those that have also targeted HUD Secretary Carson, others in the Trump Administration, including protests of President Donald J. Trump himself. Battle lines are being drawn by Buffett on the political left and people like Zell who favor more pro-business policies, like those of the GOP and it’s disruptive 45th president. MHAction directly and indirectly revealed to MHProNews their lack of interest in ‘small fish‘ like manufactured home community professionals, George Allen, Spencer Roane, Tom Lackey and SECO. Those three and their ‘education’ all have ties to business tactics that led the Chattanooga Times Free Press and other media to spotlight allegedly illegal activities that harmed numerous consumers. Per mainstream media and other sources to MHProNews, various public officials in Georgia and elsewhere are reportedly investigating those concerns. If MHAction cared so deeply about ‘victims’ of ‘predatory companies,’ where were they on this issue? MHProNews knows from multiple sources that MHAction was aware of these events, but opted not to act on behalf of those residents. Learn more, linked here. Put differently, there is an open question as to what motivated and directs MHAction or others, to target Zell, Rolfe and Blackstone instead of others like the example noted in the report about Lackey and company, which are linked from the image above and below. Click here to learn more. If the pro-manufactured home industry’s trade media doesn’t police its own, then mainstream media and public officials will eventually do it instead. Accountability is a traditional role for any industry’s good trade media. Click here to learn more about the troubling tales about Lackey, Roane, and Allen. If MHAction and their allies are posturing as fighting for the ‘little guy’ who leases a site from an alleged problem operator, why did MHAction or other resident groups effectively ignore defending the purported victims of Tom Lackey? After all, various public accounts, and governmental investigations, claim and are investigating Lackey and his defenders/promoters shown above as potentially guilty of serious criminal and civil offenses. Of course, like Buffett or anyone else, they are deemed innocent in the eyes of the law, until they plead or are proven guilty in a court of law. So why does MHAction go after firm’s like Zell’s instead? That’s not to suggest that Ken Borden at MHAction gets a call from Warren Buffett – that’s unlikely and unnecessary. All that billionaire Buffett has to know is that his money went to the Tides Foundation, and trusting the Tides’ track record would be enough for him. See what Buffett says in his own words, further below, about not-micromanaging. Then someone like Borden will be identified and selected, and they will know what to do, and not do. Facts are facts. Borden and leftist NY Communities for Change, an offshoot of the now defunct, and scandal plagued ACORN, targeted ELS communities that were reportedly well run and operated within the law. By contrast, MHAction ignored Tom Lackey, George Allen, Spencer Roane and their colleagues. An on-the-ground source told MHProNews that Lackey’s community was “a slum.” Which begs the question. Is MHAction and other like organizations funded by Tides the strong arm tactics of the political left? Are they part of a shakedown, worthy of a RICO and other investigations by state or federal authorities? Legal sources have suggested precisely that could be true. For more on Borden, and MHAction, see “Paving the Road to Hell,” at this link. Companies of all sizes in manufactured housing routinely need access to capital and financing. Every sized operation is impacted by the industry’s stigma, which Clayton Homes and MHI posture at addressing, but have arguably clearly failed at fixing. The evidence? New HUD Code home sales statistics are a stark reminder. From a report on MHLivingNews.com, which spotlights an article by Lending Tree that is superior to most anything that MHI has produced to ‘promote’ manufactured housing. See that Lending Tree statement – very favorable to manufactured homes – at this link here. It’s the facts – performance – that is the baseline reminder that MHI and Clayton ‘leadership” have failed the industry’s independents. Marty Lavin, an attorney, MHI award-winner, and long-time finance, community and retail success said that MHI works for the interests of the “big boys.” The interests of other sized firms are only protected to the extent they align with the biggest boys on the MH block, said Lavin. That would arguably be Warren Buffett, Berkshire Hathaway, and their firms that operate in manufactured housing such as 21st Mortgage or Clayton Homes. following the performance vs. the words and deeds of MHI and others reveals this to be a logical Occam’s Razor reality. Manufactured home operation of the small- to mid-range sizes were allowed to struggle, fail, or are acquired in part due to capital constraints. MHI failed them, in favor of a mega-billionaire. Who says? Among others, more MH industry award winners, like retailers Bob Crawford, or Alan Amy. Zell warned how limiting capital access was a weakness for the industry, as the exclusive quotes below to MHProNews via the late Howard Walker – then ELS Vice Chairman – reflect. MHI’s prior president, Chris Stinebert also warned the industry in a parting published message. That’s found in a column in the Journal that was arguably a thinly-veiled warning to manufactured housing professionals. Stinebert’s article could be read as a parting slap at MHI. 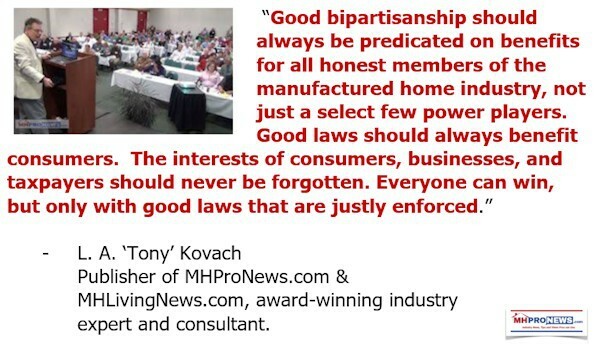 Every industry professional in the manufactured housing is directly or indirectly impacted by these factors MHI’s former president noted. Restricting financing limits sales, which harms affordable home ownership. Note, one need not agree with Stinebert’s suggested cure to his point #4 to realize that he felt that there were problems with lending and capital access that needed to be addressed. Not long after Stinebert exited MHI, the industry was about to be hit by the 2008 housing/finance meltdown in a way thousands of industry professionals did not anticipate. Money trails are used by prosecutors and civil attorneys, say legal experts to MHProNews, to demonstrate what could be patterns of behavior. FBI officials have previously told the Daily Business News on MHProNews that a significant number of special agents are versed in accounting and other forms of business and financial expertise. That’s precisely done so they can spot and find schemes that can be charged in court with various kinds of “white collar” illegal behavior. Harvard’s Eric Belsky believed circa 2002 that manufactured housing would dominate conventional housing by 2010. Belsky knew about the repossession glut related to Conseco, Greentree or other now defunct MH lenders. Belsky still believed manufactured housing would not only recover, but would dominate. Had Harvard’s expert been correct, the nation could have saved tens of billions annually. Furthermore, per research outlined on Value Penguin, the U.S. could gain $2 trillion annually in gross domestic product – impact similar to the Trump Administration regulatory roll backs or the 2017 tax cuts – if the affordable housing crisis was properly addressed. And using manufactured homes, that could be done simply by enforcing existing laws. No new legislation is needed. No need for years of debate. Just enforce the law. How did Belsky miss his estimates about the future of manufactured homes? Because he failed to anticipate that Buffett’s Berkshire Hathaway would buy Clayton Homes in 2003. That same year, Berkshire bought and rolled Oakwood Homes into Clayton, and would create via acquisitions the largest operation in manufactured housing. Among those units acquired was 21st Mortgage Corp. But let’s look for the next few moments at the 2008 housing/finance crisis. During the calamity of the aftermath of 2008, an independent manufactured home producer then told MHProNews what 21st was about to do. But it wasn’t until recently that an actual document – a purported “smoking gun” from 21st’s Tim Williams to independent retailers was actually obtained. The document, shown further below, explained why 21st would only be cutting financing support to non-Clayton Homes manufactured housing carrying independents. During a crisis, when people are desperately trying to swim for shore, details can often get lost in the fog of panic and pressure. Thus, some issues only come into focus after a crisis – like the 2008 housing/mortgage meltdown – has come and gone. When the Urban Institute or others study the manufactured home industry, and they ask why manufactured home sales are at such relatively low ebb, the 21st document, quotes from Buffett, and the videos that follow ought to be among the top exhibits examined. So how did the Urban Institute – which also gets funded by Buffett, and where he is a life-time trustee – miss all three elements? When federal officials, investors, and others wonder why manufactured homes haven’t done better, given the affordable housing crisis, these are important starting points for a clear understanding. And when independent manufactured home retailers are wondering about the future – as which supplier(s) and service providers they should use – an adage ought to be applied. Namely, that a reasonable predictor of future behavior is past behavior. This document was provided as a news tip to MHProNews. To see the PDF of this document, click here or above. manufactured home communities, that for years relied upon retailers to sell homes into their communities. independent manufactured home producers, which MHI’s own records reflect – see below – fell in numbers following the impact of the 21st document above, which Tim Williams signed. several independent transport, installation, suppliers and others were lost or absorbed by larger firms, as the consequences mounted. But perhaps the strongest example of how misleading the 21st document from Tim Williams arguably is comes from quotes from Warren Buffett’s own annual letter. Like the Clayton interview video included in this report, Buffett’s own words make it clear that Berkshire could have continued funding 21st, and thus, the industry’s independents. Instead, they collectively killed off thousands of independent firms, purportedly by pulling the financing – the access to capital – that ELS’ Zell or Harvard’s Belsky both said are so necessary. Why did Belsky miss his predicted date? Because it came before Buffett’s entry into MH? Note that MHI, Tim Williams/21st and Clayton have all been asked to address these concerns. At no time have they even tried to explain it, though previous to such inquiries they would give prompt replies to this trade media outlet. How is that to be explained? “Our gain in net worth during 2009 was $21.8 billion, which increased the per-share book value of both our Class A and Class B stock by 19.8%. Over the last 45 years (that is, since present management took over) book value has grown from $19 to $84,487, a rate of 20.3% compounded annually,” said Warren Buffett, Chairman of Berkshire Hathaway, in his 2009 annual letter to shareholders. In manufactured housing, that meant that Buffett and Munger had no doubt about the future of the industry. Investors, take note. “When the financial system went into cardiac arrest in September 2008, Berkshire was a supplier of liquidity and capital to the system, not a supplicant. At the very peak of the crisis, we poured $15.5 billion into a business world that could otherwise look only to the federal government for help,” said that same 2009 annual letter. What did that mean for manufactured housing professionals? Simply this. That the 21st Mortgage Corporation letter to independent retailers includes claims that were at best mistaken, misleading – or even false – assertions. Berkshire made billions that year. Buffett’s conglomerate lent billions that year, his letter said. Yet, 21st had the chutzpah to claim they couldn’t lend to manufactured housing retailers that didn’t carry Clayton Homes product? To better grasp the principles of how and why this was done, one must understand Buffett’s concept of the ‘strategic moat.’ The short video below explains part of it, in Buffett’s own words. Lines were arguably crossed, or perhaps the better prose is ‘double crossed.’ While Kevin Clayton smiles in the video that follows, as he says how much Clayton valued independent retailers, what they collectively did to independents fails to match those sweet-sounding words. …What Buffett Said – Who’s Responsible? “We tend to let our many subsidiaries operate on their own, without our supervising and monitoring them to any degree…Most of our managers, however, use the independence we grant them magnificently, rewarding our confidence by maintaining an owner-oriented attitude that is invaluable and too seldom found in huge organizations,” said Buffett that year. But it should also be recalled that Buffett preaches about ‘widening the moat.’ See all of the Buffett videos on the key Kevin Clayton videos on the page, linked here, or watch the videos posted on this page. Clayton talks about ‘widening the moat’ and besting competitors repeatedly in the video. Skipping deeper into that 2009 Buffet annual letter to Berkshire shareholders, we find the section that deals with Clayton Homes, and manufactured housing. Note that the graphics shown are by MHProNews, but reflect data from Berkshire or others sources, as shown. By the way, the industry shipped 372,000+ in 1998 – not 1999. And in 2009, the total shipments were under 50,000 homes So, that last sentence above by Buffett has two apparent fact errors. From the National Association of Realtors. There are a growing number of industry voices that believe that BH/CMH and MHI have by various action/inaction has kept manufactured home sales at historically low levels. The evidence is found herein and are also linked from Related Reports, further below. The collapse of so many companies in manufactured housing has several causes, including, but not limited to, the image issues fostered by groups like MHAction. But cutting off capital – in the form of lending – has to be high on the list, if not on top. High rents, high conventional housing costs, these are historic reasons for strong performance for manufactured homes. So how could MHI’s president, in the video above, say with a straight face that the industry must accept slow growth? The market share graphics, based upon various industry reports and sources as shown, tells the tale of how Clayton used ‘the moat‘ of financing and other tools to rapidly increase their market share. Note that doing so arguably shrank the overall market, as it increased their market share. But because of MHI’s problematic track record, which even their former chairman Nathan Smith (above) and MHI member Frank Rolfe (below) in the videos above and below, the trends shown herein advanced. Evidence that it isn’t just coincidence or some other mystery is found in the RV Industry’s performance during the past 2 decades. Compare their trends to that of manufactured housing during those same years. That’s arguably among the reasons why industry voices, such as the Manufactured Housing Association for Regulatory Reform (MHARR) – which focuses on federal production-related issues – has encouraged the industry’s post-production sector to organize a new post-production association. Because MHI has failed the bulk of the industry for years. Some in the communities side of the industry have begun to do just that, namely, create a new national MH communities group. And purportedly Berkshire-dominated MHI, not surprisingly, attacked that new communities trade group which publicly explained why they left MHI in the first place. The industry’s independents have witnessed thousands of firms driven out of business, or that sold out to others for less than their true value. That in turn hurts housing affordability, and thus, the nation. It was apparently done for the sake of billions of dollars, and to grow Berkshire’s strategic moat in manufactured housing. It’s demonstrably cost Americans trillions, using the logic of two NBER researchers. That manufactured housing is a proven solution to the affordable housing crisis – one that is hiding in plain sight – is clear to any open-mind researcher. Manufactured homes have enjoyed political support across the left-right political divide. But “Moat” building Warren Buffett and his minions in MHVille have debatably strangled the industry for years, costing numerous independent businesses millions per location. That monopolistic ploy in turn, for reasons previously linked, has cost Americans trillions in lost GDP. Is MHAction, MoveOn, et al – and cutting off access to capital, while supporting candidates that support regulations that kill off small businesses – all part of Buffett’s Moat strategy? The Nation, The Atlantic, GuruFocus, The Seattle Times and others have looked at various aspects of these issues, and on various aspects of the matter, they seem to think so. and now, the way that activist groups such as MHAction has harmed the industry’s image through protests and media coverage. We’re told by thoughtful attorneys that RICO and antitrust issues are among the concerns they see. to rise up and stop a corrupt ‘hiding in plain sight’ scheme. Ending that’s monopolistic “Moat” could revive manufactured homes, and would be part of the affordable housing solutions that would collectively yield to Americans trillions of dollars. For more details, see the related reports, above and below. “We Provide, You Decide.” © ## (News, Commentary, and analysis. ).